Schachbuch Taming Wild Chess Openings | Unregelmäßige Eröffnungen | Eröffnungen | Schachbücher | Schachversand Huber - Spielen Sie eine Partie Schach ! 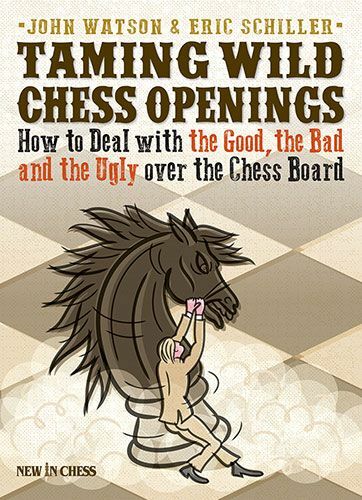 Produktinformationen "Schachbuch Taming Wild Chess Openings"
No matter how unconventional, irrational or even crazy a chess opening is, sooner or later every chess player will have to face it. When that happens, you can count on a well-prepared opponent who is more than happy to roll out his pet line. John Watson and Eric Schiller provide club players with solutions to a huge selection of these rarely-played or tricky chess openings. They concentrate upon ideas and strategy, with enough analysis to satisfy the needs of practical play. Only when a sharp reply is required, Watson and Schiller will recommend a more complex variation filled with tactics. In the vast majority of cases they present a simple and safe way to approach the position, requiring little memorization and still leading to a promising game. There is a lot of fun material in this book, and you may be surprised to see how even strong grandmasters have indulged in the craziest variations. Chess isn’t all main lines and 20 moves of theory! John Watson (1951) is an International Master who has written over 30 books, several of which have won prestigious awards. He coached Tal Shaked, the 1997 World Junior Champion. Eric Schiller (1955) is an American FIDE Master who is a highly productive chess book writer. He has taught chess for over 30 years. Kundenbewertungen für "Schachbuch Taming Wild Chess Openings"